Of all the Christmas decorations that people decorate with, perhaps the Christmas tree is the most treasured one. Whether it is a live tree or a fake tree, a decorated tree offers a festive look for the holidays. Unfortunately, no one can see your Christmas tree unless it is near a window. That is why many people choose to decorate their outdoor Christmas tree. If you have been wondering how to deck your outdoor Christmas tree with decorations, you have come to the right place. 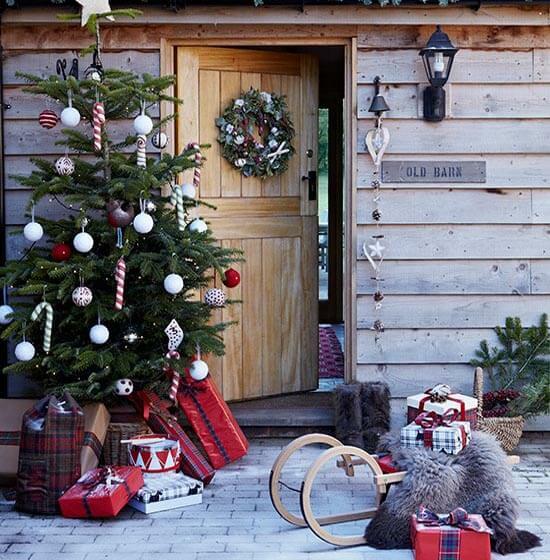 Today, let's take a look at some adorable ways to decorate an outdoor Christmas tree. These two Christmas trees are perfect and very easy to set up. 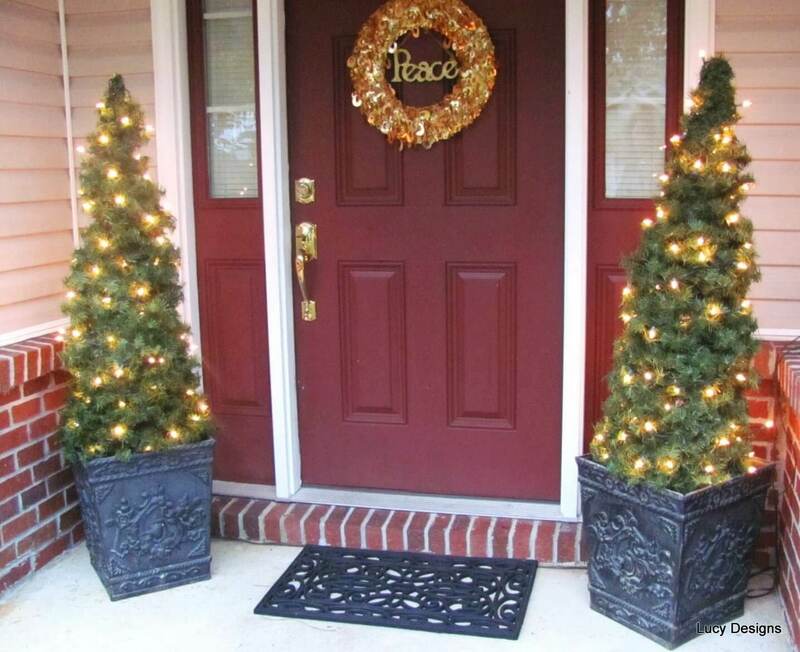 You could only use one Christmas tree, but both of the trees together make the porch look very festive. The person who decorated these trees actually made the trees by using a wired tomato cage and green garland. Simply wrap the garland around the tomato cage and use green wire to attach the garland onto it. Place the tree in a pot, and no one will ever know that it is made from a tomato cage. Feel free to decorate your Christmas trees with any decorations you want. These trees are decorated with white lights, but you could add colored lights, ornaments, and a star. 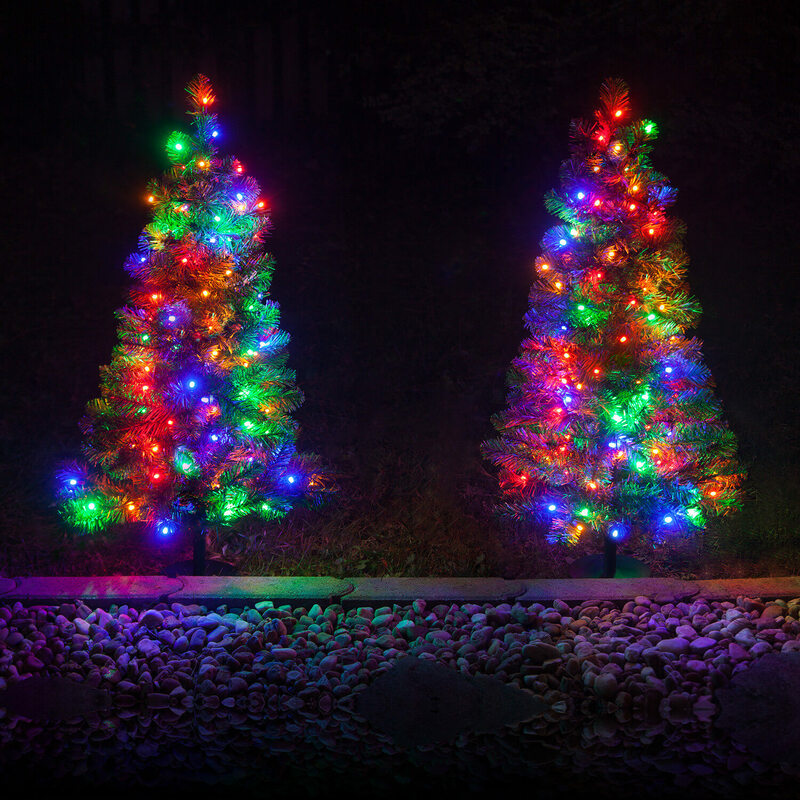 These colorful Christmas trees are perfect for lighting up pathways. You can use white lights if you want, but the colored lights definitely stand out. These Christmas trees are artificial, but if you have a live Christmas tree, consider using this idea to decorate it. You can add other decorations to your outdoor Christmas tree as well. During the winter, many birds have a hard time surviving. Much of the food they eat during the summer is gone and the water is frozen. In addition to this, it can be hard for birds to find shelter this time of year. If you are a lover of birds, you may be interested in making this Christmas tree. You can use a natural tree or an artificial tree, or you can make your very own tree out of garland. 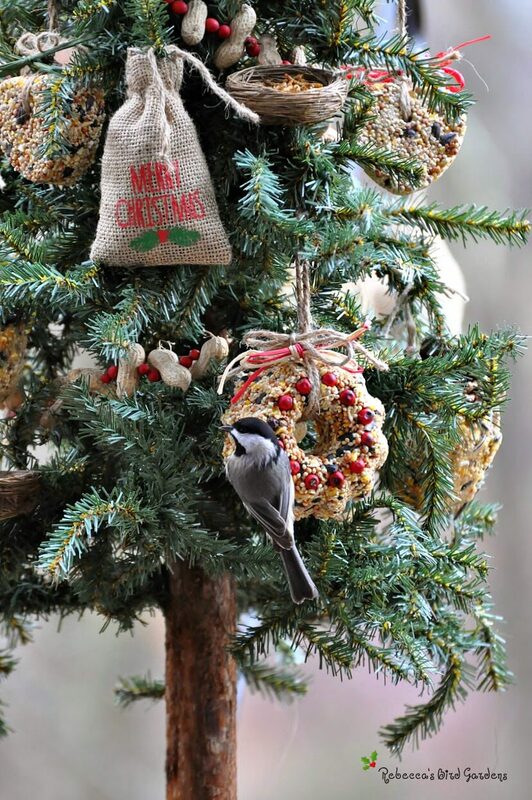 Once you have your tree set up, start decorating it with birdseed ornaments. To make these birdseed ornaments, dissolve 2 packets of unflavored gelatin in 1 cup of water in a large pan over medium heat. Add 3/4 cup of flour and 6 tablespoons of corn syrup. Mix these ingredients over medium heat until all the lumps are gone. The mixture should form into a smooth, thick paste. Once it becomes smooth, add 8 cups of birdseed to the mixture. Stir the mixture until all the seeds are coated. Add the prepared mixture to each wreath mold or whatever pans you will be using. Press the mixture firmly with the back of a greased spoon, and then refrigerate for 30 minutes. Flip the pan over and lightly tap it so that the wreaths come out. Allow the wreaths to dry thoroughly for a few days. Make sure you turn them a couple of times a day. Add some cute ribbon to them and hang these wreaths onto your tree. An outdoor Christmas tree doesn't have to be green in order to be festive. 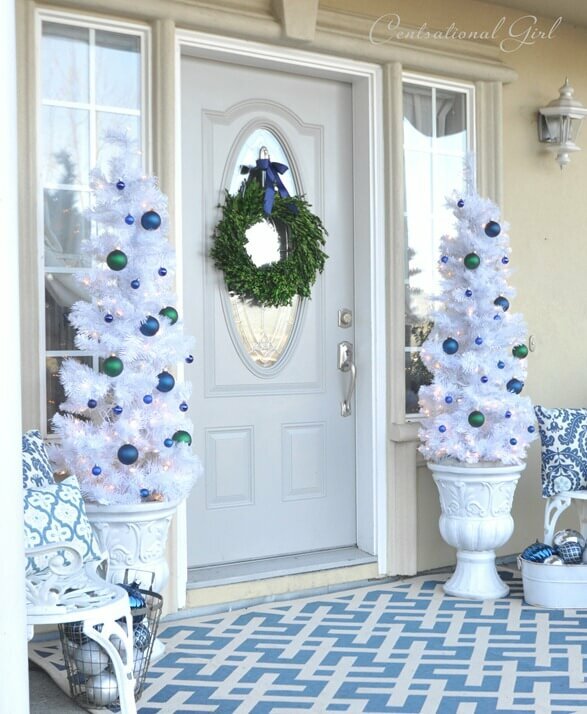 White Christmas trees are very popular and have their own unique look. 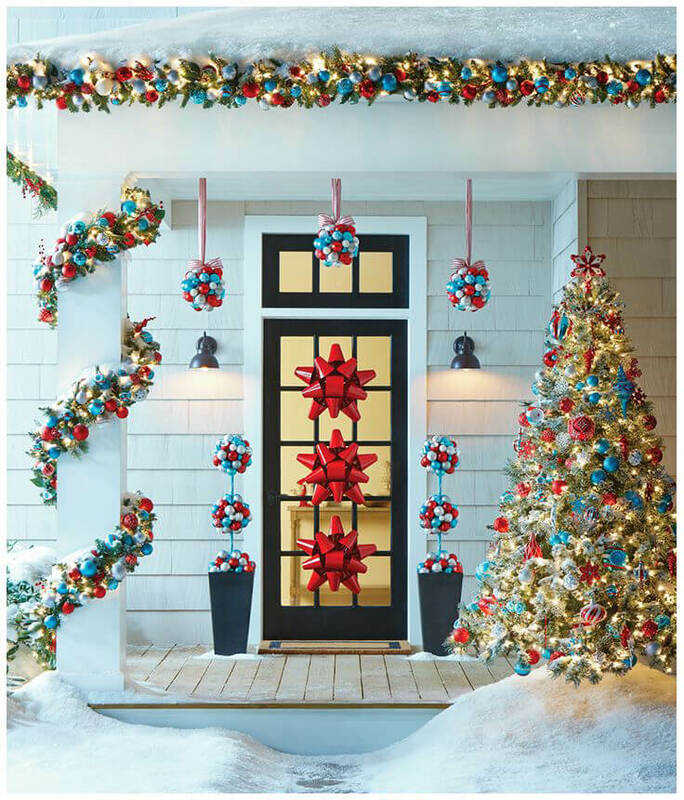 Because white Christmas trees aren't very colorful, you may want to add colorful ornaments like in the image above. 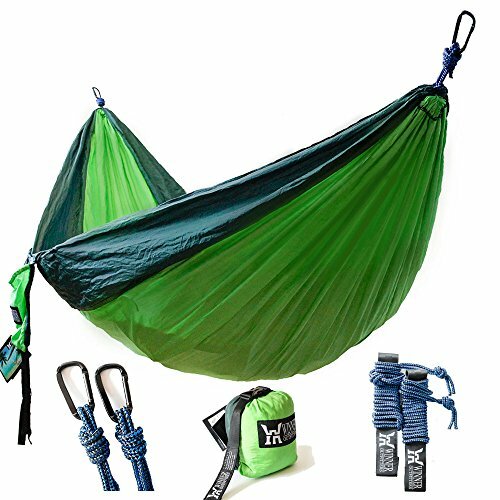 Blue and green ornaments look nice, but any color will work. Most people decorate their Christmas trees with either traditional white lights or colored lights. If you are wanting your outdoor Christmas tree to stand out, consider decorating it like this Christmas tree. 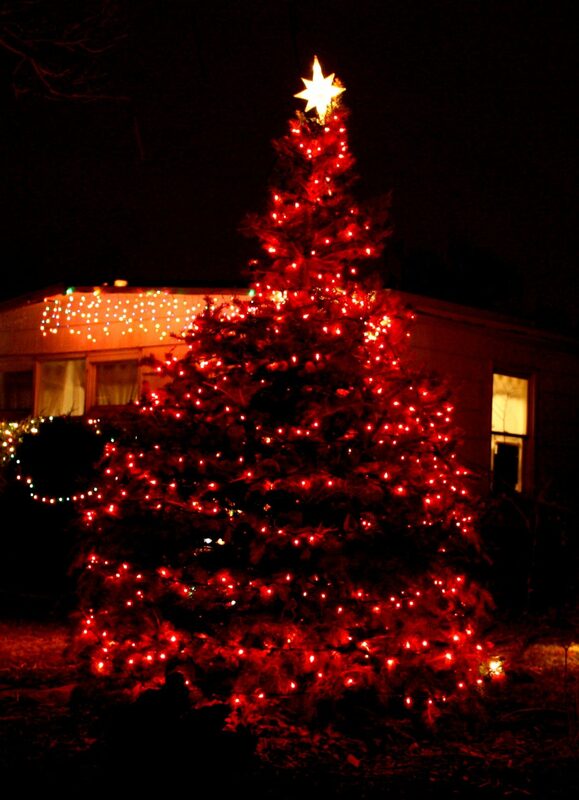 Instead of using white or colored lights, use red Christmas lights. The red lights create a unique and stunning look that most Christmas trees don't have. If desired, you can add a star on top of your outdoor Christmas tree. 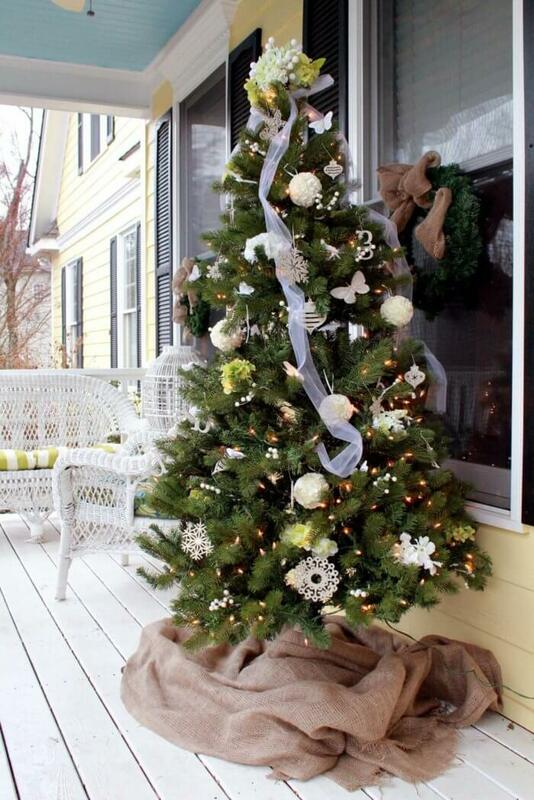 This outdoor Christmas tree idea is simply adorable. To make a Christmas tree like this one, simply decorate your tree with ornaments and lights. When you are done, add a snowman tree topper onto the top of your tree. Lay a white piece of material under the tree so that it looks like snow. 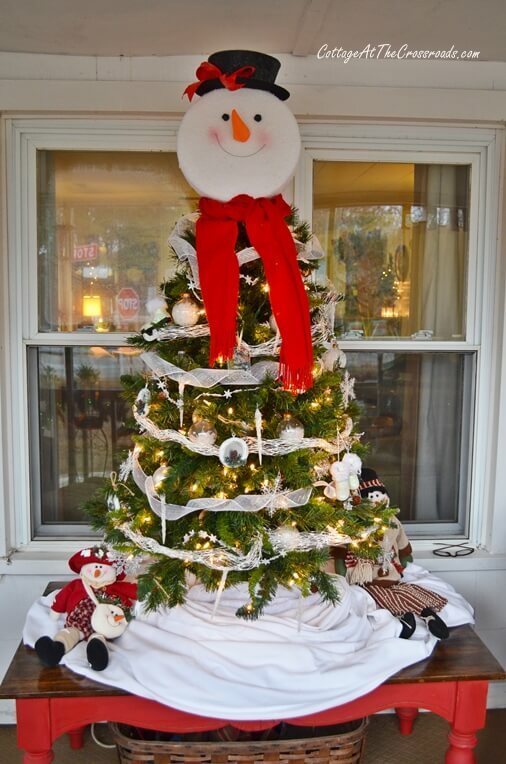 This Christmas tree idea is perfect for both indoor and outdoor Christmas trees. Sometimes it doesn't take too many decorations to make a Christmas tree beautiful. For this outdoor Christmas tree, all you need is some Christmas ornaments. You can add lights if you want so that this tree can be seen at night. The many focus point on this tree are the ornaments. Learn how to make your own ornaments with your kids here. It is very easy to decorate your Christmas tree like this one. All you need is some burlap, Christmas lights, and ornaments. 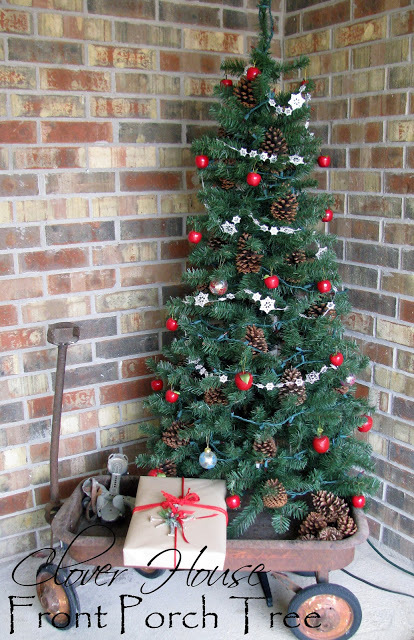 The burlap adds a rustic look to the tree. White ornaments go well with burlap, but you can decorate the tree with whatever colored ornaments you'd like. 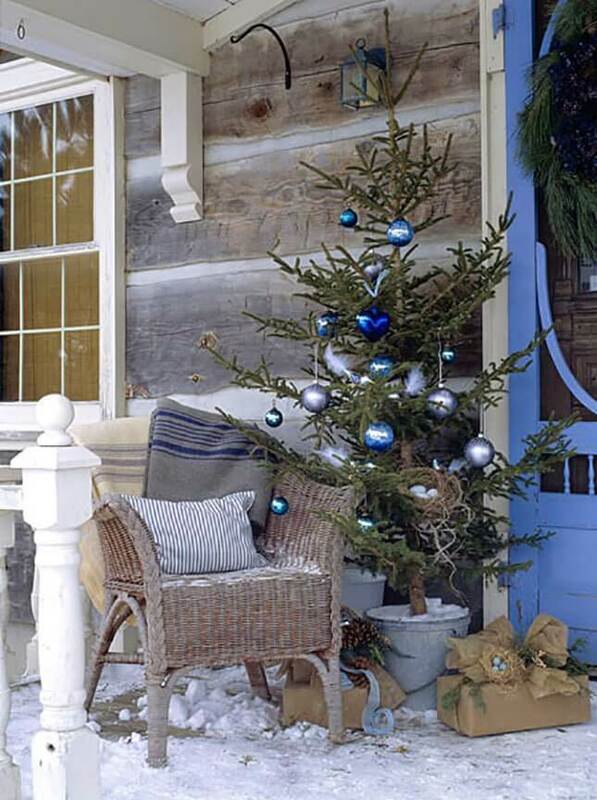 Decorating your porch with Christmas trees is such a festive way to decorate your porch for the holidays. 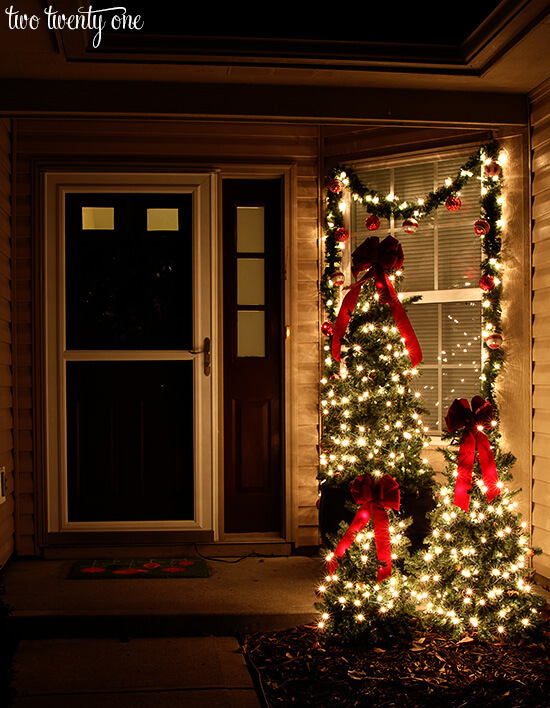 If you don't have a real tree growing in your yard, adding Christmas trees to your porch may be a good idea. This Christmas tree idea is unique in many ways. First, the three trees are three different sizes. Second, they are all on one side, as is the Christmas garland. Third, they have bows on them instead of stars. All of these unique features make these Christmas trees creative and beautiful. When you think of Christmas colors, you probably think of red and green. Gold and silver are also considered Christmas colors. What you may not consider being a Christmas color is the color blue. However, it officially is a Christmas color, and it looks great with the color red. This house decided to go all out with the colors red and blue. As you can see, the Christmas tree is decorated with red and blue ornaments, and red and blue ornaments are hung on the garland. You don't have to decorate your house with this many decorations, but it certainly is a great way to get in the Christmas spirit. 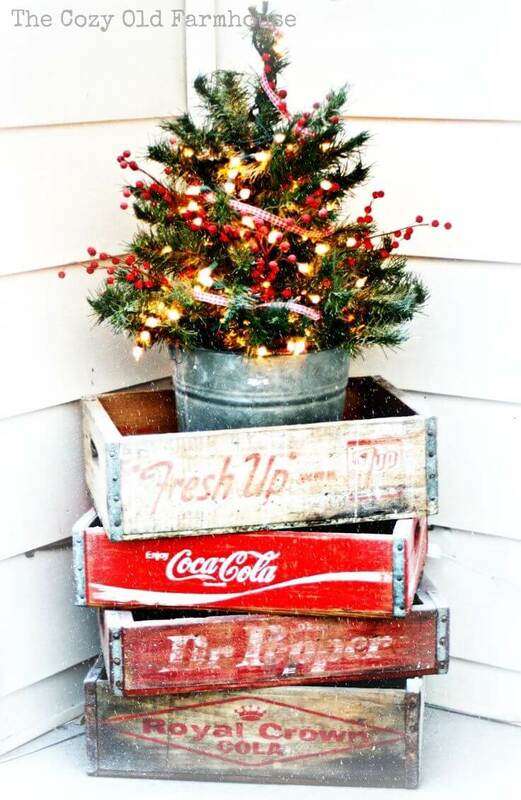 This mini Christmas tree is the perfect size for being set inside a vintage bucket. Then, stack some vintage wooden boxes and set the Christmas tree on top of them. This is a great way to reuse old soda crates and old metal buckets. Want to decorate a Christmas tree that is unique and Christmassy? Instead of hanging regular ornaments, consider hanging candy canes. They can either be real candy canes or ornaments that look like candy canes. You can add other ornaments or leave out the candy canes. This idea is perfect for indoor and outdoor Christmas trees. If you are wanting a vintage Christmas tree, look no further than this idea. Instead of having the Christmas tree be placed on the ground, consider setting it on an old wagon. This Christmas tree is made with natural ornaments, including pinecones and apples. 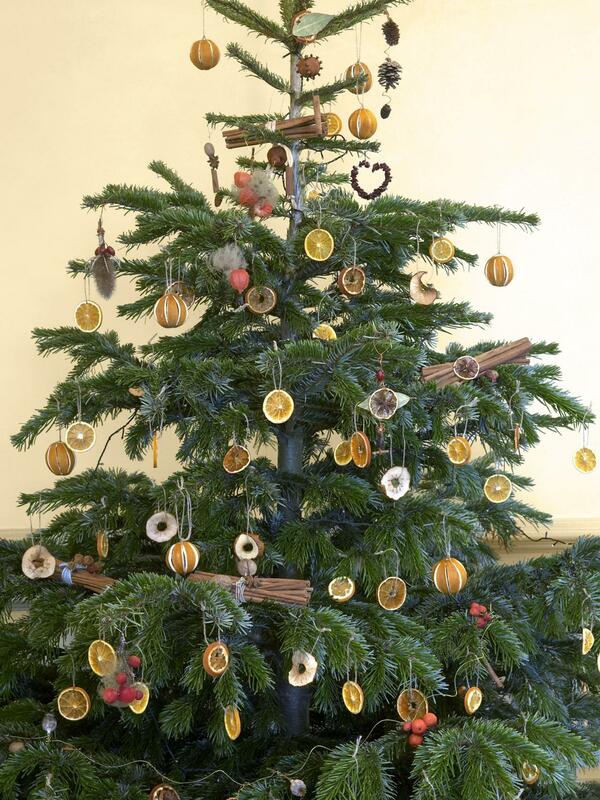 You can either set the apples and pinecones onto the tree or you can attach them to strings and hang them. Or perhaps you'd like to decorate with vintage Christmas tree decorations. The decision is up to you. Once again, this is another outdoor Christmas tree that is decorated with natural ornaments. It is full of pinecones, apple slices, dehydrated oranges, cranberries, and cinnamon-walnut bundles. Basically, anything that is natural can get hung onto this tree. Depending on what you hang on your tree, it may make your porch smell beautiful with Christmas scents. I hope this article has inspired you to start decorating your outdoor Christmas tree. Whether you have a real tree growing or you put a fake one out in your yard, an outdoor Christmas tree helps brighten up your lawn. As you can see, there are so many ideas when it comes to decorating your outdoor Christmas tree. There are vintage Christmas tree options, natural Christmas tree ideas, and modern Christmas tree decorating ideas. Make sure you use lights that are rated for outdoor use. 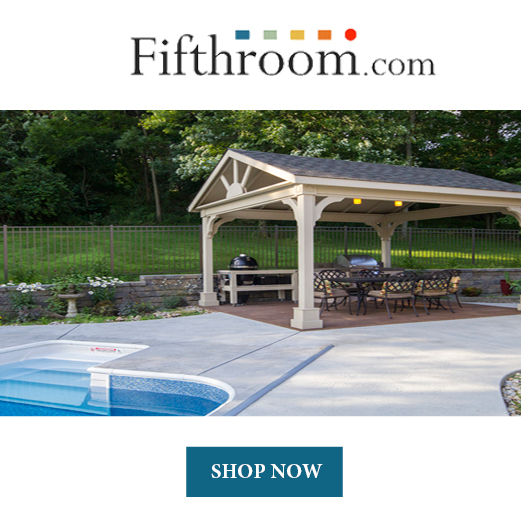 Lights that are certified for outdoor use are specifically made to withstand cold and wet conditions. Indoor Christmas lights, on the other hand, are not made for outdoor conditions but are a safer option for indoor Christmas trees. 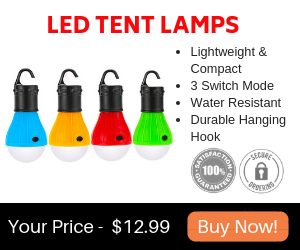 When decorating your outdoor Christmas tree, you may want to consider using LED Christmas lights. LED Christmas lights are much more durable than regular Christmas lights, and they last much longer. Although they are more expensive, they are worth the extra dollars. I hope this article has given you all the information you need on decorating an outdoor Christmas tree. 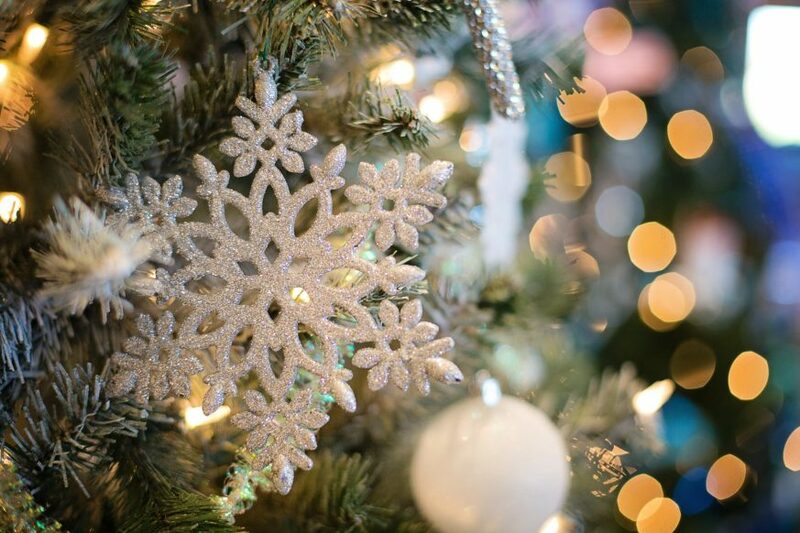 Decorating an outdoor Christmas tree isn't only fun, but it also makes your yard look like a winter wonderland. Have fun!